That little square thing in the trigger frame is the sear elbow. Just extend it a bit somehow and I’ve got a functional trigger. The thumbscrew fits quite snugly in the CF frame’s trigger rod slot. It’s almost perfect, really. Yes, I’ll now have to remove the grip panels to take out the valve, but it’s a small price to pay. Also, extending the magazine followers is an option, but I want these magazines to be shared with my DAM’d H7, and I’d rather not compromise magazine compatibility with an already working gun. Last edited by Ghost Flanker; 02-13-2018 at 01:23 PM. I have an uncomfirmed theory on the below crono speed. By the way, the on/off assembly I’m using in the video is a ULT. When you say you enlarged the breech hole, did you remove more material than what would be needed to form two right-angle corners on the back of the breech hole to make a D-shape? 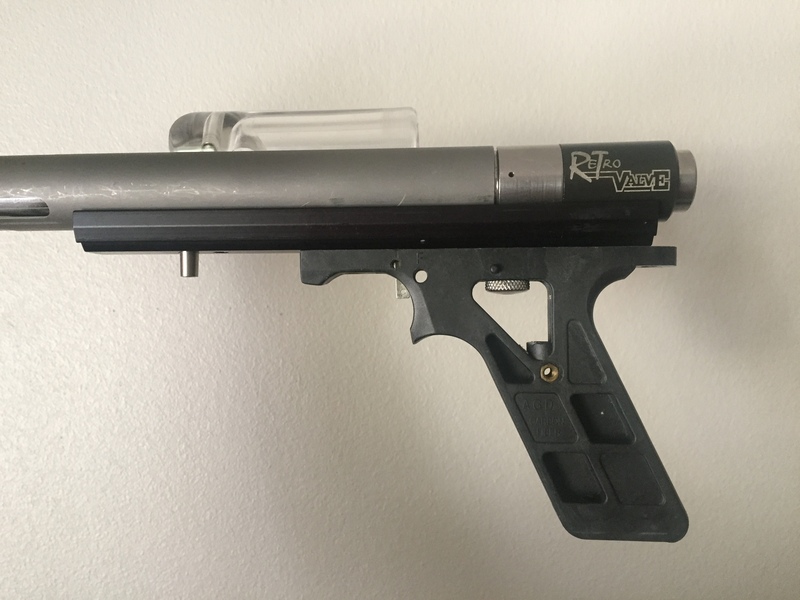 To test your theory that the breech hole is venting too much gas, swap out the Doc’s adapter for any standard twistlock barrel and measure the velocity with roundball. If it still shoots low, it would indicate the culprit lies elsewhere. Besides, not everyone can own an FN 303, but if I pull this off as a viable home mod that others can follow, then any Automag owner with simple tools can have a magfed mag. -It is going to be no such thing as a "simple tools" mod, and even a loose interpretation of "viable" is going to be iffy. One option, although it negates one of your requirements: Go with a fixed magazine. Get some square tubing, similar to an SMG-68 magazine, and weld it directly to the 'Mag body. Fit it with a follower, probably made from Delrin, that 'stops against the front two corners of the D-shaped hole in the body, but has a projection to push the last round all the way up into the breech. Have a slot in the side of the mag tube so you can retract it like a .22 pistol magazine follower, and have a hole in the back of the mag tube that rounds can be dropped into. You can have a pin, or a clip or something welded to the back edge of the mag tube near the body, so that a shortened section of rail can "clip" onto it, maybe even wrap around a little to help blend things together. Other options: A trigger shoe can be fabbed from steel or stainless and TIG welded to the sear rocker. You'd install the rocker by sliding it through the rail from underneath, then inserting the pivot pin. The grip frame would have to have a notch milled into it to allow the shoe to slip through into the trigger guard. If you can find somebody good with a TIG and some stainless sheet, you could have a magazine well welded to the 'Mag body, in order to use the mags you want. The rail could clip on as noted above. An interesting option: With a little clever work, how about a Tiberius magazine, and power the Automag with the 12-gram? That would rock. How carried away do you want to get? Weld a low sight rail to the top of the mag body, and have it stick out past the back of the body tube. Drill and tap the valve for a valve retaining screw hole facing up, and run a short screw down through the top of the sight rail. Not an easy mod, but it'd make field-stripping way easier. And BTW, if you get moving on this mod, just drop me a line. I'll mill out the barrel adapter for you at no charge. I really like all these ideas, especially the fixed magazine and the Tiberious magazine mods (either of which could make for an extremely cool Mauser C96 style pistol! ), but I don’t have access to a TIG welder. And I really appreciate you offering to mill out my barrel adapter. I just might take you up on it after I successfully mount the magwell. Thank you. -Get one of the new rifled barrels that are supposed to work with FS rounds, and add a small telescope. Cerakote the whole thing black. I suppose I could have enlarged it too much.I had thought the adapter might be the culprit at one point ,but my 2 friends mentioned used FSR modded twist lock barrels with the same velocity issues so I've kind of ruled it out. I like Docs ideas of a fixed magazine,I'd love to have a mag the could be loaded with 10 Rd tubes or "pez despensers" myself. If you need additional rigidity after removing the front screw from the body, I'm thinking that drilling and tapping the rear of the body in a couple places would allow you to use set screws to bite into the valve to help hold the body in place. You'd still need additional support further up the line but every little bit helps.